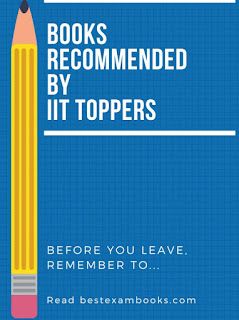 We are covering all important books recommended by iit toppers in our JEE books review section. Continuing with our series on iit preparation books, we cover the last portion of jee syllabus for iit books. To get a good rank, focus on chemistry is equally important and is relatively easier than math and physics. We have come here with best books for jee mains and advanced to prepare JEE Chemistry. Most of the JEE aspirants are lenient towards the preparation of chemistry. They do no give it ample attention. However, it is the subject where you are assured of success if you have thoroughly studied irrespective of examination scenario. Chemistry is the subject where Input and output ratio is equal. It simply means more time you would give to the subject, more success you would get in JEE papers. Here, I have mentioned a grading system (marks out of 10) similar to what we did in our previous articles on iit JEE books. On the basis of difficulty and the order of books mentioned is from beginner’s level to masters! This grading system is based on our conversation with IIT toppers in which they gave their review on books used by them. Jee Main Books are not different from Books for JEE advanced, almost all books will cover few portions of both levels. Here the portions are covered as per divisions of chemistry- physical, inorganic, organic. We are dividing the full article into three sections. This book is exceptionally well in width and depth of coverage of JEE portion with utmost clarity. Along with thorough coverage of theory, it consists of plenty of solved examples which consolidate the theory portion covered. All past year questions topic and chapter-wise are covered as solved examples in the material. In the end, the exercise consists of conceptual, numerical subjective and objective type questions. The difficulty level of exercises matches that of actual JEE scenario. It provides a crux overview of theory for revision. There are many solved examples and unsolved questions which provide a very thorough and perfecting touch to JEE physical chemistry preparation. The specialty of this book is the deep coverage of basic concepts of stoichiometry, eudiometry and mole concepts which are taken for granted by other authors for granted. At the end of the book, there is a large question bank comprising of multi-concept questions and of each type as per JEE pattern, this makes the book a must-have. The best book available in the market for inorganic chemistry at this level. Though not specifically designed for JEE, this book covers the complete width of jee inorganic chemistry. It makes even the most mundane topics of inorganic interesting with its presentation and explanation. Certain topics are covered beyond JEE level so the curated study is required. Reading theory is crucial for JEE inorganic chemistry, but only reading is not sufficient every time. This book completes the gap which is left even after reading concepts from JD Lee i.e. their applications. After completing a particular chapter from this book you will find yourself at ease. The best thing about this book is, this does not have too much of "time-pass stuff" which some books tend to have in them to make the book look bulky. This book is one stop solution for practicing jee inorganic portion. A very descriptive book for beginners. We would keep it in the awesome category as chapters are nicely explained. The book is written in an explanatory style which makes all the concepts very clear. IIT aspirants can find the full syllabus for IITJEE at one place. Purchase this book in class XI and if you can complete this book earliest at your end; it will help you to follow 95% questions of both Mains and Advanced. 2. "A Guidebook to Mechanism in Organic Chemistry by Peter Sykes"
It’s a handbook with well-explained mechanisms which is useful for preparation of Organic Chemistry for engineering as well as medical entrance exams. This book serves as an authentic source to deal with Organic Chemistry. The book is written by a prominent chemist, therefore the mechanism is evident in all the chapters. The best-covered topics are – Strengths of Acids and Base, Structure-Reactivity and Mechanism, and Radicals and their Reactions. It a must read the book for Organic Chemistry, however, it has an overload of information, which may confuse JEE aspirants, if they are not guided properly. If a candidate feels comfortable with Indian Author can blindly pick books written by OP Tandon. Each chapter is explained with minute details and illustrations to make topics simple. Make your own notes while going through this book. OP Tandon book has all types of solved and unsolved questions collections in the form of MCQs, Reasoning type, and Matching type questions very much similar to the new JEE pattern. Instead of going online in search of pdf, a serious aspirant must own a book copy because of bulky contents. “Choosing OP Tandon organic chemistry for IIT JEE will be a good choice as it has more than enough information to help you to clear the exam. We know it very well that any Topper never discloses all his secrets, however, above given books recommended by IIT toppers will help you a lot to find a right book for each section of Chemistry. If you find any book which you feel should have a place in this list, please mention that in the comment section.